Meyer Collaborates with Fermilab, Berkeley Lab on Key Large Hadron Collider Component - Meyer Tool & Mfg. Officials of the of the U.S. Department of Energy's Fermi National Accelerator Laboratory and Lawrence Berkeley National Laboratory (Berkeley Lab) announced December 15 the completion of a key component of the U.S. contribution to the Large Hadron Collider, a particle accelerator under construction at CERN, in Geneva, Switzerland. 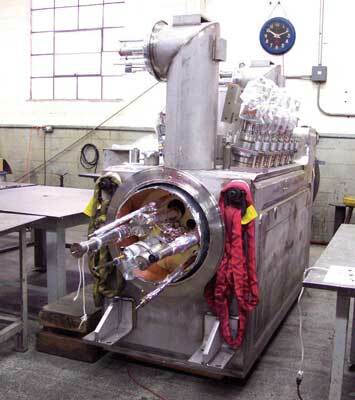 After a competitive bid process, Berkeley Lab awarded Meyer Tool & Manufacturing (Meyer), a woman-owned small business in Oak Lawn, Illinois, the contract to manufacture eight cryogenic distribution boxes, components of the cooling system for the new accelerator, which is due to begin operating in 2007. Meyer has successfully completed the first box. "Meyer has an excellent working relationship with Fermilab and Berkeley Lab," said Bruce Strauss, U.S. LHC Accelerator Program Manager in the DOE's Office of High Energy Physics, who visited Meyer on December 15 to celebrate the completion of the first box. "Since its inception, Fermilab has always supported and utilized the great number of machine shops and small manufacturing businesses that are in the Chicago area. Because of the success that we are seeing today, we have confidence that Meyer will deliver the remainder of the boxes on schedule and on budget." ​Berkeley Lab engineer and project manager Joseph Rasson noted the significance of the achievement. "This is a critical milestone," Rasson said, "and it sets a perfect model of DOE labs working together with a small business to design and build one-of-a-kind hardware." The first completed distribution box at Meyer. A total of 8 boxes will be built to hold all the cryogenics, electrical power and signals for the CERN magnets. The distribution boxes will connect the LHC's superconducting magnets with the systems that keep the magnets operating at temperatures near absolute zero. 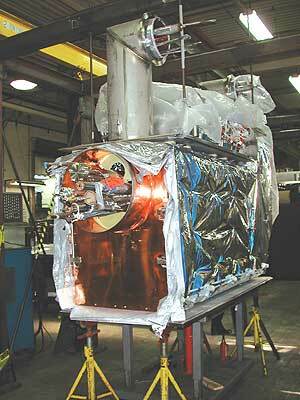 The boxes supply cryogens in the form of liquid and gaseous helium and deliver power to the magnets. It is very tricky getting power from room temperature to a cryogenic temperature near absolute zero," said Fermilab cryogenics engineer Tom Peterson, who worked closely with Meyer. 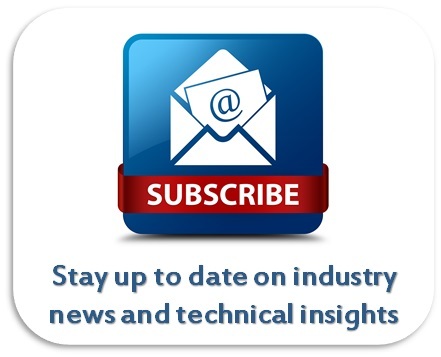 "Accelerators with cryogenics or superconducting magnets use distribution boxes to supply cryogens for the cold devices. You need to have the right interface between the magnets and the other components of the accelerator in order to get the power from room temperature down to 2 Kelvin. These boxes will do the job." This design had never been done before, so it needed fine tuning, he added, and agreement as to the best way to do it. "The considerable input we got from Meyer on the assembly helped us come up with a better design." Officials agreed that Meyer's ability to provide precise assembly work, stainless steel machining and welding and leak checking made it one of only a very few suppliers that could have handled the job. While Fermilab provided the technical oversight for the project, Berkeley Lab designed the distribution boxes and contracted with Meyer. Although Meyer is fabricating most components of the 13,000 lb. boxes, both Fermilab and Berkeley Lab fabricated several of their components. Fermilab and KEK, a Japanese particle physics laboratory, manufactured the quadrupole magnets, and Brookhaven National Laboratory fabricated the dipole magnets that will be connected to the distribution boxes when all the pieces come together in Geneva. "All our employees at Meyer take great pride in our work, especially the critical components and complex assemblies we manufacture for the DOE and the National Laboratories," said Ed Bonnema, VP Operations for Meyer. 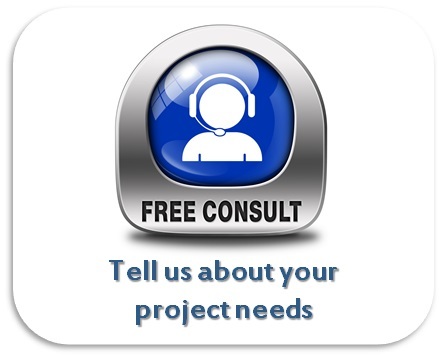 "We work as a team to meet the difficult and exacting specification requirements associated with these types of projects. Today, as a result of this exceptional collaboration, we have the first of the distribution boxes complete, with three more on assembly stands." In a unique partnership among two national labs and a small local business, Fermilab, Berkeley Lab and Meyer started working on the distribution boxes in April 2003. Meyer shipped the first two distribution boxes to CERN in January. Fermilab, Berkeley Lab and Meyer plan to have all eight boxes completed by September 2005. Founded by Frank Meyer in 1969, Meyer has contributed components and assemblies to most of the major US scientific programs of the last quarter-century. 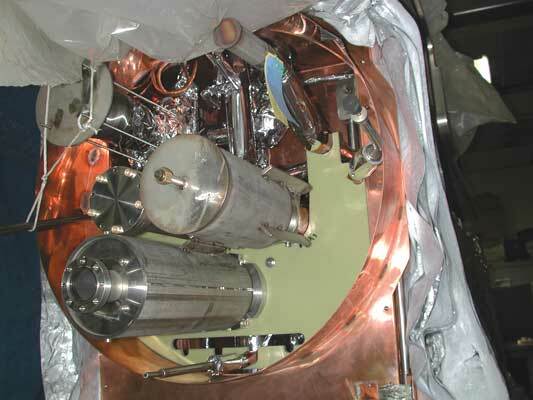 Specialists in cryogenic, vacuum and pressure technologies, Meyer has contributed to such major projects as the Cryomodule Assemblies for CEBAF at Jefferson Laboratory, the Cryomodule Vacuum Vessels and the Airside Radio Frequency components for the Spallation Neutron Source at Oak Ridge National Laboratory, the Mark II Cryostats for Cornell, the Canadian Light Source and the SRRC in Taiwan, Precision Positioning Stages for the Advanced Photon Source at Argonne National Laboratory, Re-cooler Heat Exchangers for RHIC at Brookhaven National Laboratory, large diagnostic aluminum and stainless steel vacuum vessels for the National Ignition Facility at Lawrence Livermore National Laboratory, Cryogenic Transport Carts, Cryogenic Fill/Transfer Station Vessel and Cryostats for the Omega Laser Program at the University of Rochester. The eight distribution boxes represent a portion of the $531 million total US contribution to the LHC machine and detectors. "The distribution boxes are one of the last portions of the US-LHC project to be completed," said Fermilab engineer Jim Kerby, US-LHC Accelerator Project Manager. "The accelerators won't work without them." ​Fermilab is a DOE Office of Science national laboratory, operated under contract by Universities Research Association, Inc.